The Accelerated BSN to Ph.D.
Students with a previously completed bachelor’s degree in any discipline have the opportunity to pursue an accelerated bachelor of science in nursing degree. The idea behind these program is to satisfy all necessary general education learning outcomes with knowledge obtained in the student’s first bachelor’s program, and going on to focus entirely on their nursing courses in their accelerated nursing program. 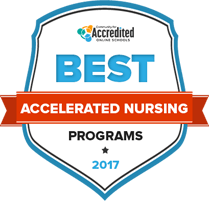 We found the top accelerated nursing programs in the country, based on a school’s cost, acceptance rates, and graduation rates. Look below to explore 2017's top-ranking accelerated nursing programs. There are plenty of resources students can use if they decide to study nursing at the University of Washington's Seattle Campus. Those that decide to go through the accelerated bachelor's in nursing program will have access to some of the best hospitals in the region. Students will learn from experience while studying through one of the local hospitals, all while completing their bachelor's degree in a short time frame. This program is ideal for students that want to enter the field of nursing sooner rather than later, since all the courses are taken back to back. After earning an accelerated bachelor's degree in nursing from Drexel University, many students go on to work in a hospital while focusing on a field that they enjoy. However, there are multiple directions students can take their bachelor's degree after graduation. The accelerated bachelor's degree is best for students that want to enter the professional field after graduation rather than continuing their education. The course structure is designed to prepare students to become registered nurses in a short amount of time, preparing them for entry level positions. However, students always have the option to continue their education. To make sure that students can learn nursing in the shortest amount of time possible, Duke University offers an accelerated bachelor's degree in nursing program. However, there are prerequisites that students need to meet. By requiring a bachelor's degree in a different field, Duke can ensure that students spend all their time on nursing instead of other core classes that would traditionally be required. The accelerated bachelor's degree prepares students to become registered nurses and begin their career as a nurse, no matter where they want to serve as a professional nurse. New York University offers one of the fastest accelerated bachelor's degree programs for nursing with students being able to earn their degree in just 15 months. However, students are required to already have a bachelor's degree with adequate core classes before joining the program. The accelerated nursing program at New York University is offered only on campus, but it gives students the chance to gain experience in some of the best hospitals in the region. After earning their degree, students will be prepared to take the exam to become a registered nurse. When studying toward an accelerated bachelor's degree in nursing at Loyola University Chicago, students will be getting the same quality education that would come from studying toward a traditional bachelor's degree in nursing. The only difference is that the accelerated program is completed in a short amount of time, allowing students to make a quick transition into the field of nursing. While completing their accelerated bachelor's degree, students will get to learn from highly qualified professionals in the field, earning a combination of academic and technical experience. The University of Pennsylvania offers flexible options when it comes to picking what type of accelerated bachelor's degree in nursing students want. Students can even opt to earn an accelerated bachelor's degree while also pursuing their master's degree in nursing. No matter which accelerated track option students decide to do, they will receive the same nursing education expected at the University of Pennsylvania. All graduates of the school are prepared to test to become registered nurses, and they will also be ready to begin their career with an entry level position. If students want to earn their bachelor's degree in nursing in a very short amount of time, the University of Rochester offers a few accelerated programs. While students already need to have a degree in a different field, they will be able to get a second degree, a bachelor's in nursing, after just one year of studying in the field. During this time, students will gain the academic knowledge needed to become a registered nurse while also earning the real world experience that will be expected of them in a professional role. The staff at Rochester is there to aide students should the need any help along the way. Students that want to earn their bachelor's degree in nursing while also moving on to earn their master's degree will like the curriculum at the University of Miami's Main Campus. While other institutions have accelerated nursing programs to help students become registered nurses, the main goal of Cincinnati's nursing program is to prepare students to earn their master's degree. Of course, students will also have the knowledge necessary to become a registered nurse after graduation, but the course structure is best designed for those that want to go on and earn a master's degree in nursing. There are a few main options to earn an accelerated degree in nursing at Emory University. Students can choose to earn their bachelor's degree in a shortened format while still getting access to the same resources that students following a traditional path have. Also, students who know they want to earn their master's degree can choose to study toward their bachelor's degree and master's degree in nursing at the same time. While studying at Emory, students will be able to join in research projects and learn from staff and faculty that are some of the best in their fields. While students will not have as much time to absorb their instructions while studying toward an accelerated bachelor's degree in nursing at Ursuline College, they will have other benefits. For example, students in the accelerated program enjoy smaller classes to get a more in depth education on a daily basis. There are also multiple tracks students can take while studying toward their accelerated bachelor's degree in nursing at Ursuline. Students will study in labs, gain technical experience and also have the academic knowledge necessary to become a nurse and earn a position in a professional role. The U.S. Bureau of Labor Statistics estimates a 19 percent increase in the number of nursing jobs from 2012 to 2022. As a solution, schools are encouraging students to enroll in accelerated nursing degree programs that get them on the fast track to getting a license and a job. Whether students have had long-time goals of becoming a nurse or are looking for a career change, accelerated nursing programs are the fastest way to get the training needed to obtain a license and start working in the field. This page outlines the different kinds of accelerated nursing degree, including what students can expect to study and how the programs prepare them for the rigors of nursing. Accelerated nursing bachelor’s degrees are for those who have completed at least a bachelor’s degree in a discipline other than nursing. Building on what students learned in their previous degree programs, students who enroll in accelerated BSN programs take only the nursing-specific courses that those who major in nursing are required to complete. Through classroom instruction and hands-on clinical experience, students who pursue these programs learn what they need to pass the nursing licensing examination in a short period of time. According to the American Association of Colleges of Nursing (AACN), there are more than 250 accelerated nursing bachelor’s degree programs around the country, and several more are in the process of being developed in order to train enough new nurses to meet the growing demand. These programs have been gaining popularity in recent years, according to a survey administered by the AACN. The agency reports that in 2012, there were 15,002 students enrolled in accelerated BSN programs, up from 13,605 just two years prior. And as schools work to attract more students into these programs, the enrollment numbers will continue to grow. Students who enroll in an accelerated BSN program can generally expect to complete their degrees within about 11 to 18 months, depending on the specific nursing school they attend. These programs attract students from diverse educational backgrounds, but they all have one thing in common — they are motivated to draw from their previous knowledge of social, natural and behavioral sciences, as well as the humanities, and apply it to nursing theory. Armed with the critical thinking skills they gained in their previous degree programs, accelerated BSN students learn principles specific to the nursing field and how those theories actually apply to the delivery of quality patient care in the real world. Each school has its own specific qualifications that it looks at when evaluating applicants to its accelerated BSN program. However, the following are some common requirements that are expected of prospective students, as well as an overview of the application process. Bachelor’s degree in a non-nursing discipline. Completed prerequisite science courses, such as biology, statistics, anatomy and chemistry. Complete background check (after admission). Covers the body’s physiological responses to illness and how nurses assess them. Also includes information on how the body regulates internal systems. Focuses on how patient assessments are performed and the skills nurses should possess to determine patient needs. Specific topics may include assessment strategies and what to do with the information obtained through the assessment process. Discusses the evolution of the nursing profession. Includes information on changes in nursing practice over the years, as well as the legal and ethical standards that these professionals are expected to adhere to. Provides an understanding of the unique needs of children and the techniques nurses use when treating this patient population. Also covers how nurses can work with the families of the children to whom they provide care. Students in this course can expect to learn different nursing theories and how nursing research is conducted. They also learn how to read and critique a research study, and how to craft a study from beginning to end. Students who are interested in delivering advanced nursing care to patients can earn an accelerated master’s degree. Like their accelerated BSN counterparts, those who enroll in an accelerated MSN program are expected to have at least a bachelor’s degree in another academic discipline. In addition, schools that offer these programs require students to complete science and math course work that will provide a foundation to help them understand the complex concepts they will encounter in the program. Accelerated MSN programs allow students to get the theoretical knowledge and hands-on training they need to pursue advanced clinical care nursing jobs when they graduate. As a result, the goals of the program are twofold: These master’s degree programs are designed to give students the basic training they need to pass the nursing licensing examination — which is required after completing the first half of the program; and after students are licensed by their state, the accelerated MSN program picks up where the first half of the curriculum left off, giving students an advanced education in nursing that will allow them to obtain a higher-level job than they would have qualified for after completing a bachelor's degree. According to the AACN, there are about 71 accelerated BSN programs at nursing schools around the country. These programs, which take about three years to complete, are also seeing an increase in enrollment. In 2012, there were over 6,100 students enrolled in accelerated MSN programs, up from about 5,900 the year before. Completion of at least a bachelor’s degree in a field other than nursing. Completion of prerequisite science and math courses — such as anatomy, biochemistry, psychology, statistics and physiology — with at least a C grade. Completion of the GRE or GMAT (depending on the school). Submit their application with the school’s required fee. Send official transcripts from bachelor’s degree program. Submit to a background check (after admission into a program). Gives students the tools they need to communicate with their peers in writing. Includes information on techniques for effective written communication in the workplace, as well as in a scholarly context. Provides information on how laws influence the delivery of care, and the common legal concerns that nurses must consider when working with patients. In addition, students in this course also learn about ethical decision-making in order to stay within the guidelines of the nursing profession. This course is designed to build on the knowledge that nursing students already have of pharmacology. Topics may include pharmacokinetics, pharmacotherapeutics, and the state and federal laws that govern how medications are dispensed. For students who are interested in working with older patients, this course provides information on the acute care needs of this population. This course covers the complexity of working with geriatric patients, the problem-solving abilities that nurses need when treating complex illnesses of older patients, and how changes in the health care system affects the way nurses work with the older population. Explores the theories associated with providing mental health care to patients. Provides an understanding of mental health nursing theory, chronic psychiatric disorders and the challenges that nurses face when working with those who have mental health disorders. In addition to course work, students in accelerated MSN programs may be required to declare a concentration area and take complete the required coursework in that specialization. These programs put students on the fast track to providing the highest level of nursing care, or to become leaders in the field such as educators, researchers and health care managers. By training students at this level, nursing schools are making strides toward alleviating the burden of the nursing shortage, which is in part the result of the many nurse educators and other senior-level nursing professionals who plan to retire in the next few years. Accelerated BSN to Ph.D. programs take four years to complete and allow students to choose a specialization based on their career goals and interests. For those who want to influence the nursing field by conducting research, teaching the nurses of the future and affecting public policy, accelerated BSN to Ph.D. programs provide a fast track toward meeting these goals. In addition, students who are interested in gaining the knowledge and skills they need to enter advanced clinical nursing practice also enroll in these programs. As a result, some programs allow students to choose between a clinical track and a leadership track, which provides them with the specialized knowledge needed to meet their specific career objectives. A bachelor’s degree in nursing from an accredited nursing program with a minimum grade point average of 3.0 (may be higher depending on the specific program). Completion of the GRE, depending on the program (a minimum score may be required). Submit transcripts from nursing degree program. Submit proof of a valid nursing license. Obtain and submit letters of recommendation. Complete a personal essay or nursing position paper. Submit current resume or CV. Participate in an interview with members of the admissions committee. This course provides students with a look at the social components of health care delivery and the societal issues that may contribute to some people having access to better care than others. In addition, students get a more in-depth look at the legal and ethical concerns that influence health care delivery. This course includes theories related to health care management and provides information on how nursing professionals can use their expertise to become health care entrepreneurs. In order to get a look at how these concepts work in real life, students may be required to read case studies. Focuses on the anatomy of a nursing theory, and how researchers develop theories and test them using evidence-based research methods. Provides a look at epidemiological studies and how nurses contribute to tracking infectious diseases that threaten the public's health. In addition, students may learn about how to educate a community about disease prevention, treatment and control. Students in this course gain an understanding of how information technology is used for the delivery of health care. The course provides an overview of different types of nursing and health care systems and how they are used. Although students who enroll in accelerated nursing degree programs on all levels reap a number of benefits, particularly being able to jump-start their careers in a relatively short amount of time, these programs are not for everyone. Just like any other degree program, students who enroll in accelerated nursing degrees face a number of challenges because of the rigors associated with these degrees. The following are some common pitfalls that students experience when they enroll in accelerated nursing degree programs. It's important to not only look at the benefits of an accelerated nursing degree, but also consider the challenges in order to make an informed decision. Although all degree programs take time and effort to complete, accelerated nursing programs can be especially demanding because they condense so much material into such a short schedule. Unlike their counterparts in regular nursing degree programs, students in accelerated programs must be prepared to complete all of their course work without any breaks between sessions. Many students often burn out as a result of this demanding schedule. Students who are juggling their degree programs with family responsibilities may have a hard time in an accelerated environment. Many adult learners are tasked with the need to maintain some kind of work-life balance as they earn their degrees; however, accelerated programs make this concern much more difficult to address. Although the work that students do in these programs can ultimately benefit their families, students may have difficulty spending quality time with their loved ones throughout the duration of the program. In order to train nurses for the demands of their jobs, degree programs are designed to be challenging. However, because students have to learn such complex material in a shorter period of time, accelerated programs increase academic demands exponentially. Students must consider whether they are able to handle the amount of pressure they’re likely to face in such an academically demanding environment. Students enrolled in accelerated nursing degree programs are generally unable to hold a job as they pursue their degrees, which can make this option cost prohibitive for many people. In addition, the AACN reports that although schools are working to increase financial aid opportunities for these students, there are currently not many scholarships available for those in accelerated programs. This can put a financial strain on many potential nurses. Students who are considering accelerated nursing degree programs should take an honest look at their personality to ensure that they're making the right choice. Students who are prone to procrastination or cannot handle stress very well are likely to become too frustrated to perform well in these programs. The intensity of accelerated learning is not for everyone, so some students may find that they're better suited for the more traditional degree option.